Our campers can be picked up from locations across Derbyshire. 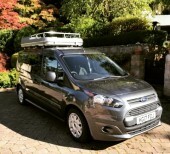 If you are looking for a campervan to hire contact us today and we can recommend vans that are based in places such as Derby, Chesterfield and Buxton. If you are visiting Matlock, Ashbourne, Ilkeston or Swadlincote ask us for vans in nearby locations that we can recommend to you. I am kontiki, hire me today! Bongo is a high-spec modern-day VW T6 campervan that’s built for adventure. Thor�is a one perfect camper for you. The van that we offer are high-quality, and fully equipped with everything you need. VW T30, 2.5L Diesel Auto, 2 berth but seating for 4 passengers(V5 registered 4 seater). Camper Jossette offer an excellent service at all the times.VW camper in the highest standard, and proud of the vehicles that we provide across the UK. Saffronchucklebus is a 1976 Bay Devon camper with original engine and interiors. Lovely red 1.9 T5 VW, raring to go! Drop us a line on Camperbug today.